If you need more information about this program, contact us. 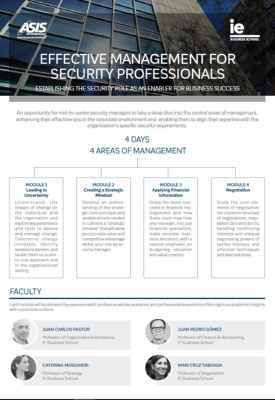 Designed in conjunction with ASIS international, our Effective Management for Security Professionals program helps security professionals refine their business acumen. Over five days, participants develop key interdisciplinary competencies to supplement their technical expertise. Experienced security executives guide participants through the security challenges that permeate the modern market and equip them with the necessary tools to overcome them. The program’s hands-on methodology ensures that participants leave the program as enablers of their businesses’ success. Once they have developed their own business plan, participants share ideas through group discussion, allowing for personal development in a collaborative environment. The Effective Management for Security Professionals program provided key executive learning topics and materials; insightful and thought provoking discussions with seasoned professors; real world case practices and exercises; all topped off by a very pleasant environment in company of security colleagues from around the world with unique perspectives from each of their fields of expertise. A 4 day package that will positively impact the rest of my career! With IE Business School and ASIS quality is always a given… However, the diversity and richness of each participant’s experience is what really added value to the learning experience. Security Management is really about leadership and finance and managing a way through that is essential for your success…. The course participants come from all over the globe. It is really a tribe of security professionals coming together and sharing their experiences and learning together. This course is giving Security Professionals the business acumen skills that they wouldn’t get from any other type of course. Besides meeting colleagues, friends and getting new friendships, specially the skills were very important to learn, were negotiation: it was very strong, we saw some weaknesses and learnt a lot about finance but also about strategy and leadership. IE Business school is a dynamic hub of market-focused education. With an aim to mirror the frontline of sector developments, our innovative programs explore the most up-to-date knowledge and industry skills. Students learn using practical, hands-on methodologies, led by a world-class faculty with real industry experience. We pride ourselves on our diverse, international environment, welcoming students from over 130 nationalities on campus and with 160 nationalities represented in the wider alumni network. This melting pot of backgrounds, talents and cultures is the ideal greenhouse for ambitious entrepreneurial professionals with a global outlook and the drive to lead transformational change. At IE, we want to encourage you to take the next step in your career. For this reason, we offer you the chance to access the program’s Early Registration Process. Students enrolled before May 2nd 2019 will receive a scholarship with 5% off the full tuition cost. Neither scholarship is compatible with other deductions. As an IE alumni you are part of our community, and we want to support your passion for Lifelong Learning. Therefore, all IE alumni receive 25%* off tuition fees for all Executive Education programs. *Alumni from Intensive Programs (less than a week duration), Summer Schools or High Impact Online Programs will receive 15% off. At IE, we are committed to encouraging companies to enroll teams of their employees. We believe this allows them to explore new perspectives together and speak a shared language of change. Companies that sign a Corporate Agreement are eligible for a 15% off the tuition fee for Executive Education programs. An additional concession may also be available for a Corporate Partner Agreement.